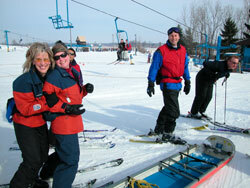 The Timber Ridge Ski Patrol is a volunteer organization serving skiers and snowboarders in Southwestern Michigan. We are taking the names of interested people to start with OEC training in Spring 2015. We are searching for dedicated individuals who wish to join the patrol. If you would like more information or want to sign up for the class, fill out our on-line contact form. There's absolutely nothing more rewarding than putting in a hard day's work - and having a good time with friends while you're doing it. If you're investigating how to become a patroller, we think you'll probably agree with this philosophy. If you love the great outdoors, skiing and/or riding in fluffy clouds of fresh powder, and assisting those who need medical care, you have come to the right place. The main objective of being a member of the National Ski Patrol is to assist ski area management by caring for injured skiers and in making mountain recreation safer and more enjoyable for every guest. There are many other benefits as well. You'll be a respected part of the snowsports industry. You'll perfect your athletic skills. You'll make wonderful friendships that will last a lifetime. If you’ve hung out long enough with anyone who enjoys speeding on snow while strapped to wooden planks, you’ll probably realize that being on the patrol means that you’re part of a different breed. To enjoy snow is one thing, but to help a severely injured guest on a thirty degree slope in a raging snowstorm while awkwardly bundled in ski gear just might require us all to be a little atypical. If that sounds like you, then welcome home. In honesty, there's really no such thing as a typical ski patroller. Nevertheless, when you hear the words "ski patroller," you probably think of someone performing a mountain-side rescue of an injured skier. The truth is that it takes all kinds to make this team. Emergency care is an important part of the mission of the National Ski Patrol, but that's just one way patrollers assist the public. We educate. We communicate. We participate. 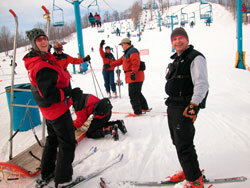 National Ski Patrol members are people with a strong desire to help others. They are people who want to learn (and use) emergency care skills, improve their skiing or snowboarding, and help make mountain recreation safer for all. If this sounds like you, read on and find out how you can join this exclusive team. Are you interested in becoming a Timber Ridge patroller? 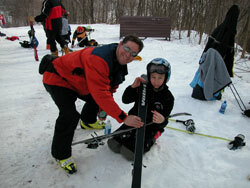 Join the Timber Ridge Ski Patrol! For more information or to place your name on our current contact list, stop by the Timber Ridge Ski Patrol room during the season. 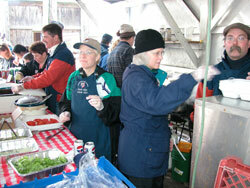 You could also complete our on-line contact form or download an application.